When it comes to beef shortribs, I've been a late bloomer. 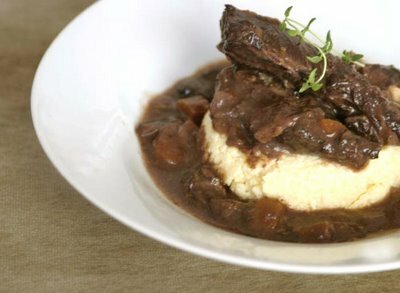 I had never heard of shortribs until my maiden visit to The Marmalade Pantry, when they first opened several years ago. I was about to order the Chicken Pot Pie, when a friend called out from a nearby table: "You must try the shortribs!" Given her enthusiasm, I decided I must indeed. That first taste of shortribs was the start of an obsession that I find near impossible to shake. I went back every other week after that first visit, each time to buy a taste of that wonderfully robust, fork-tender cut of meat, braised slowly in red wine and herbs, served on a bed of mashed celeraic and topped with crunchy root chips. Many a time I left disappointed—all too often I would be told: "Sorry, but we're out of shortribs today." Several months later, the inevitable happened. I sat myself down on the restaurant's chocolate brown booth seat, crossed my fingers and spoke my order to the waiter. His reply: "I'm sorry, but the shortribs have been taken off the menu." I damn near jumped out of my seat and ran to the kitchen to confront the chef, but someone slid a bowl of root chips in front of me and I crunched my frustrations out on them before deciding that it was time to take matters into my own hands. That weekend, I pored through my cookbooks hoping to find a recipe for Braised Beef Shortribs. No joy there. I went through my stacks of food magazines and couldn't find one that matched my idea of how rich the dish should be. Finally, I turned to the Internet and found this Charlie Trotter version and a more fuss-free one from Chef Eric C Maczko, winery chef at Napa Valley's Pine Ridge Winery. I tried the latter and it was just fantastic. The main prep for the dish is really in opening the wine bottle, searing the flour dusted shortribs and a bit of frying and stirring. Once you pop it in the oven, the dish makes its own magic, melding all the wonderfully deep flavours into an unctuous tasty sauce with achingly beautiful chunks of melt-in-your-mouth meat. Over the years, I experimented with this dish, adding or subtracting different herbs and vegetables, and using different kinds of red wine (I find Merlots work best). Each time, the shortribs are the star of the show, always complementing whatever herbs I throw in (I like using more thyme and less rosemary) and always impressing guests, who like me, had never heard of shortribs until that first mouthful. In this weekend dinner, I paired it with J's recipe for polenta, which was the perfect accompaniment with its rich, creamy texture and taste derived from long, slow cooking in a double boiler. I've enjoyed many a shortrib but have never braised them myself. Sounds delightfully simple, though, and your description of the resulting dish is amazing! That looks delicious the meat looks soo tender. What butcher at river valley? There's a butcher there? MM, the butcher is called Espirito Santos. Looks such great comfy food!